Tweetdeck has confirmed what we all already knew – it's been snapped up by Twitter. 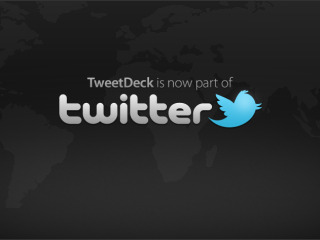 In a statement which makes no allusions to how much it was bought for, Tweetdeck founder and CEO Iain Dodsworth thanked its user base and said that Tweedeck under Twitter's wing would be for the 'power' user. "We've grown from one team member and a single user, to a team of fifteen and a user-base of millions. "The reason for this growth is simple - our unwavering focus on providing high-quality tools and services for the Twitter-centric power-user. "This has always been our core audience - the most active, influential and valuable users of Twitter and social media in general. Quality over quantity." Dodsworth also explained: "The mainstream Twitter user-base is well catered for by twitter.com and the official mobile clients. And by becoming part of the official platform, TweetDeck will now fill that role for brands, influencers, the highly active and anyone that just needs 'more power'." There's no news on how quickly we will see changes to Tweetdeck but they are certainly on the cards, said Dodsworth. "Change may well be inevitable, but we remain the same team, staying in London, with the same focus and products, and now with the support and resources to allow us to grow and take on even bigger challenges." Although money wasn't mentioned in the blog post, CNN Money reported earlier this week that the app service was bought for $40 million.